Lady and the Blog → Personal Blog → Daily Diary: Cheers! This year, I’ve been trying to find drinks that I like. I’m not much of a drinker – never really got into it when I was younger. So, as an adult, the taste of beer or wine is hard to enjoy. Recently, I found Riesling which I am a HUGE fan of. It’s funny though because anyone who has been drinking wine for a while doesn’t really like the taste. I mention it and their noses squish up like they are smelling a dirty diaper. It’s ok though because I really do enjoy the flavors. WELL, last night I went out with friends to a local Japanese restaurant and ordered a cranberry , seltzer and lime. (I only drink when I’m home or with Bill) My friend order a SAKE Sangria and it was flipping awesome! I’ve tried sake before and I do NOT like it. 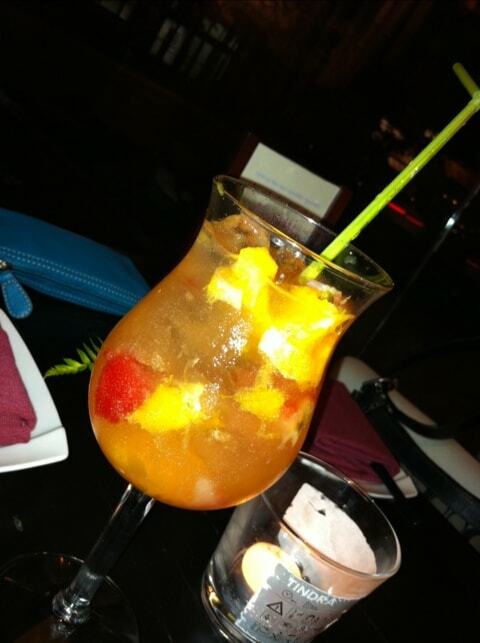 BUT the sake sangria was fruity and awesome!! It was also $5 because Thursday is ladies night at this place. If you drink, do you like fruity tastes? Or are you more of a beer kinda girl? Both although I don’t like generic beer, Guinness and dark ales are more my kinda thing. Love champagne and sweet wines. Also, gin & tonic, cranberry and vodka and vodka and OJ. Don’t like things that are ‘sugary’ although I do like sweet :). I prefer fruity. I am in love with sangria but I hate red wine alone. Go figure! lol And I’m not a big drinker either. Can’t deny my love for wheat and hops. I love Irish reds and dark hoppy ales. I can drink beer until I pass out…. which is usually the case. Sake I like as well as Sake Bombs. I can’t say I would like Sake Sangria because I think Sangria is revolting but can’t knock it until I try it. Just the word Sangria makes me want to gag. However some warm sake with some Toro Sashimi… Subarashii!!!!! !